What's a pricey wine like you doing in a place like this? WHAT A DEAL You never know what you’ll find on the shelves at Grocery Outlet. 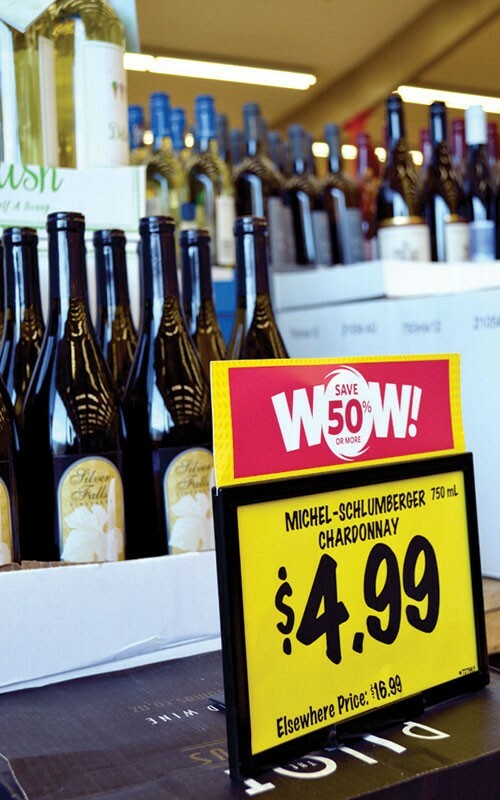 Wine is sold at such a deep discount at Grocery Outlet, it can seem too good to be true. Should I be wary of the provenance of a Sonoma Coast Pinot Noir that I recently found advertised for $6.99 at the bargain market—or is provenance, indeed, too precious a term in the context of a store that's tagged with the mostly affectionate epithet, "Gross Out"? "It used to be the store that carried the dented cans and the day old bread," says Pete Kochis, manager and wine buyer at the chain's Napa location. "And that's just not the case anymore." The wine department has particularly improved in the last five years thanks to a new team of buyers at the chain's offices in Emeryville, headed by director of wine, beer and spirits, Cameron Wilson. "As a wine team, we are committed to tasting everything we send out to the warehouse," says Wilson. While the 280-plus stores are independently owned and operated, they choose from a selection off goods at the main warehouse. Yet only one winery that I contacted returned my emails and calls, after I mentioned I found their wine at Grocery Outlet: Valley of the Moon Winery, source of that $6.99 Pinot. Valley of the Moon general manager David Macdonald is happy to explain how the wine wound up there. Macdonald says it's a typical story: He was already well into selling the 2014 vintage, which meanwhile got an updated packaging design, as well, when a quantity that had been aside for a wholesale customer was declined for their own business reasons. "We were left with several hundred cases of wine we could not plug back into the distributor network." They sold some through the tasting room, but Macdonald doesn't see the GO partnership as detrimental to the winery's image. "There's nothing to be bashful about seeing your brand in a place like this." Valley of the Moon Winery 2013 Sonoma Coast Pinot Noir ($6.99) Enticing aromas like potpourri and Christmas candle, neatly knit with spicy fruit and tannins—would be a value at regular retail, $25. Jenner Sonoma Coast Pinot Noir ($7.99) Made by Fritz Underground Winery, this is no disappointment with notes of sandalwood incense, pomegranate and strawberry jam. Vixon 2013 Sonoma County Zinfandel ($6.99) Inky, Cabernet-like, with reticent, dark aromas of blackcurrant, fruitcake and damp, rich soil, this mystery wine has a food-friendly mid-palate. Esterlina 2015 Cole Ranch Riesling ($4.99) The winery appears to have folded, but this mouthwatering, very slightly off-dry wine is no bust.